Thank God for Girlfriends Ornament is a thoughtful gift for Christmas or any occasion. 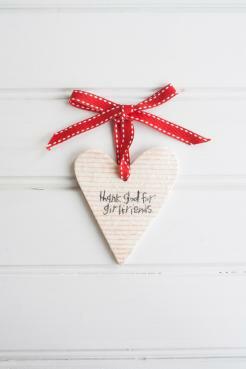 Handmade heart shaped ornament is approximately 5" x 3". 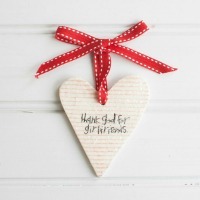 Each ornament is hand painted with red pin stripes and dusted with glitter. Decorative ribbon included for easy hanging.